“Love letter” sent by post, including SAE, on 26th January. Received a signed photo on 24th February. Email to Skeldale Vetinary Centre on 26th January. Received an email reply from Julian within hours and a set of signed photos on 7th February. Email to Leeds United Supporters Liaison on 26th January. Email resent to Sales Team on 28th February. Email sent via his official website on 15th February. Signed photo received on 24th February. Success! Preston North End dealt with my request, despite me saying I am a Leeds fan, quicker than Leeds United themselves! I love Preston. (Very nice) email sent to Leicester City (the club who cruely sacked him) on 28th February. I didn’t have the best of starts to my Monday morning. We have a new coffee machine at work, so thought I would bring in some pods from home to use. I’ve been doing this all last week, and the machine was behaving itself well. That was until this morning, when I used THREE pods and only got, what can only be described as a single shot of coffee, instead of an entire mug. Pod #1 – Chucked into the pod graveyard (the container in the coffee machine for used pods), without even a drop of water being passed through it. Pod #2 – Enough to make an Espresso, even though it was not an Espresso pod! Pod #3 – Went the way of Pod #1… chucked away, without being used. By the machine, may I add, not me! This has made me very angry. The small amount of coffee has pacified me a little, but I will be returning for more coffee soon, although this time won’t be using the fancy machine that George Clooney advertises. In better news, I saw Sir David Attenborough trending on Twitter this morning. Whenever I see this, I can’t lie and say that I am not worried. The legend is approaching 91 years of age, after all. It was all good. Sir David will be presenting a new series of The Blue Planet. I love this natural history documentaries, so to hear that another is on its way is very pleasing. I am still awaiting a signed photo of Sir David (see earlier blog), although have received a lovely set of autographs from The Yorkshire Vet staff. A little update on the coffee machine – I tried it again later in the day (after writing the above). The thing now leaks, and when I say leaks, I mean leaks like that incontinent old woman on Little Britain. Water went everywhere. I must have used half of a huge kitchen roll to clean it up, and given the fact I didn’t do anything to cause the leak (besides have the audacity to use the damn thing to make a cup of coffee), it’ll probably start spilling out water again! I’ve decided that from tomorrow morning, I’ll be going back to the good, old, water boiler. It may taste of lime scale, but it works! Oh, and no, I did not manage to get any coffee from the machine to accompany the leak! I asked my DIY Man – AKA “Dad” – to come and change the light bulb. He is excellent at this kind of thing and I wouldn’t have been able to do this job. Being a shortarse 5 foot 5 and having as much balance as a one-legged horse, I didn’t really want to risk changing it myself with a stepladder, especially as the bulb is under a fragile glass dome, which would no doubt shatter into a million sharp pieces if I went anywhere near it, leading to me cutting myself, dying from blood loss and receiving a fine from the landlord for breaking his property. My Dad managed to retrieve the bulb from behind the great glass ceiling dome. Except it wasn’t a bulb. It was a tiny tube. You know the kind you get in an office? It was like that but 100 times smaller. Where on earth could I buy one of these? One things for sure, I couldn’t buy one from my Tesco Local. I went to the shop that sells everything (apart from drugs and livestock)… Amazon. After much thinking, I bought what I believed to be the correct bulbs, tubes, whatever… The next day, Claire rang me at work to say that they had been delivered, but they were too small! Yes, it was a tiny, tiny light tube. 1,000 times smaller than one you would find in an office! This was getting serious, there was only so long I could shower by candle light (OK, I used the landing light, with the bathroom door open). My Dad, the best handyman in the world, managed to find the required bulb in Screwfix and even fitted it for us. Everything is now working, there is now no longer a need for candles, but we do have a multipack of tiny light tubes that we’ll never need. 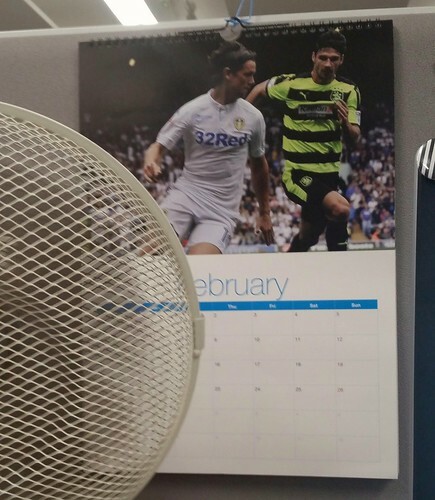 Whoever picked the photos for this year’s Leeds United calendar needs to be sacked. Why put a Huddersfield Town player right in the centre of February. This photo was taken last year, when Leeds got beat by Huddersfield in the home game. To rub salt into the wounds, we lost to them away yesterday, and because of this calendar, I am not allowed to forget it! I have been stalking celebrities. Not in a seedy, perverse kind of way. I have not camped outside Cheryl Cole’s house with a pair of binoculars. Instead, I have been contacting famous people by post and email. Last night, I wrote a very long letter to Sir David Attenborough – by far my favourite famous person of all time. The man is a legend and someone whose work I have followed, and been inspired by, since I was a little boy. Apparently Sir David replies to fan mail, so I am anticipating something in the mail from the man himself over the next few weeks. Another minor celeb (and I do mean minor – you won’t even find him on Celebrity Big Brother) is Julian Norton. Heard of him? I thought not. He is one of two vets on the Channel 5 TV series, The Yorkshire Vet. Despite being on C5, the series is really, really good – like a real life All Creatures Great and Small. How would be best to contact Mr Norton? I emailed the veterinary surgery via their website. Within an hour, Julian replied, thanking me for my email and promising to send me something signed. How nice of him! My last ‘stalk’ of the day may prove a little more difficult. I would like the autograph of the Leeds United manager, Garry Monk, and my favourite player, Pontus Jansson. I have emailed the Supporters Liaison address, which I found on the Leeds United website. I have also tweeted the new owner, Andrea Radrizzani, asking him to follow me, so I can send him a direct message, or provide me with an email address, in which I can send my request for a siggy from Monk and Jansson. I won’t hold my breath on a response. I did think about asking the Queen for a letter, but think the only way I’ll get anything from her is on my 100th birthday. Assuming I live that long, she will be 157 years old. Still more likely than Leeds United sending me anything.